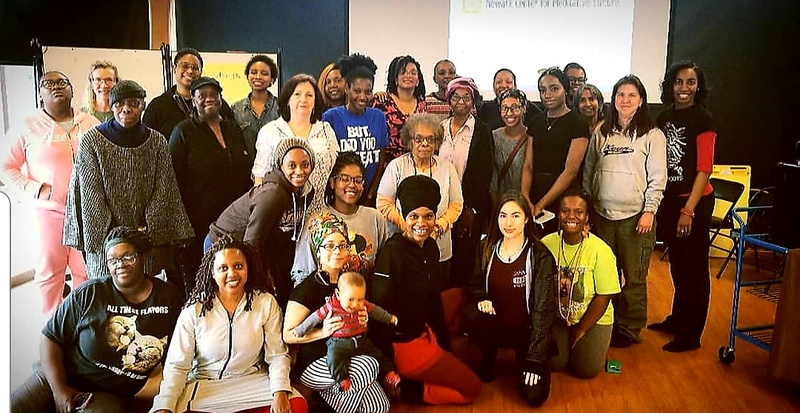 This weekend’s Women’s Retreat was a multi-generational gathering of nearly 50 women of diverse backgrounds and from all different walks of life. The retreat was mindfully and lovingly guided by five women who are leaders in their own fields. We kicked off the retreat with a moving spoken word opening by TaNisha Fordham who brought nine teen-aged students to the retreat. Jillian Faulks-Majuta lead a Kemetic Yoga session that physically grounded guests in the power of self-care. The day continued with passionate workshops about caring for mind, body and spirit. Kamilah Crawley, who organized and emceed the event, offered sessions about the intersection of mindfulness and women’s self-care and lead discussion groups on the complex and nuanced notions of the modern Superwoman. Michelle Beadle Holder explored mindful eating and the frequent everyday choices we make about how we nourish our bodies and helped us become more mindful of the environments where we break our bread and buy our food. Her presentation was followed by a nutritious and soulful lunch provided by Arelis Hernandez and Rabbit Hole Farm. Aleah Gathings presented on the power of words and affirmations and guided retreatants in a symbolic ceremony to release unconstructive thought patterns. Mandara Parashakti Akiwumi facilitated a process to help participants “Stop the Story”, release narratives that hold us back and re-narrate our current truth. We ended the retreat by writing self-care letters to our future selves — to be mailed and opened just when we most need the reminder. Throughout the day retreatants were encouraged to hold a non-judgmental space for everyone’s opinions and experiences and to self-reflect through conversation and journaling. Participants readily shared their own resources and several lists were compiled with books, websites, and places of interest for people to visit to continue the deep work that was initiated at this retreat. This entry was posted in Gratitude, Kemetic Yoga, Loving-kindness, Meditation Day Retreat, Self-Care, Spirituality, Yoga and tagged #meditation, healing, mindfulness, selfcare, women's retreat. Bookmark the permalink.